Lorna Lu was born and raised in culturally rich Yunnan in the South-west of China (the birthplace of the tea tree). She worked for a tea company in China and has been presenting her tea ceremonies for many years. Now based in Scotland, she regularly takes her ceremony to functions and special events. 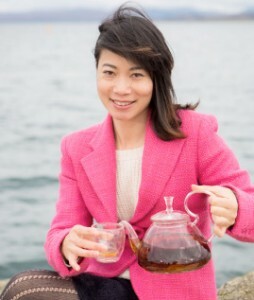 Lorna can deliver a complete new modern tea ceremony, an elegant tea experience that inspires the body and mind, share her knowledge and passion to create an inspired tea culture. Our range of teas are sourced from China’s greatest teas, includes loose teas, hand crafted flowering teas, compressed Puerh teas. We help you to choose teas that suit your business and individual taste. We can match food with teas for restaurants and hotels to enhance your business.